I had spent quite some time in the hot south of India in Vellore and was looking for a cooler place in addition for the possibility of practicing medicine at the "grass root level". So I decided spontaneously to go to Darjeeling. Through Indian contacts I could start at the "Planters hospital", a small private hospital. It used to belong to the tee plantations and has 30 beds. I accompanied Dr. Sherpa at his work. However this mainly consisted of outpatient clinic work, comparable with the routine of a general physician. But I was looking for something with more "hands on". I continued to ask around, and by luck I received the phone number of Dr. Chaudhuri, the gynecologist at the District hospital. Through his friendliness it was possible for me to receive a permission from the Medical superintendant. Now the way was free for a unique experience. It turned out that a foreigner had never worked here before and that since a few years no Indian medical students had been here either. But that was only to my advantage: Physicians and nurses were extremely friendly and helpful! 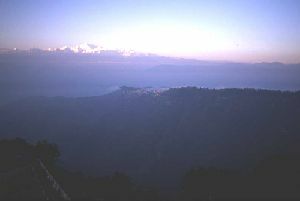 Darjeeling is one the most famous "Hill stations" in the northeast of India. At over 2000m altitude it lies in the foot mountains of the Himalayas between Nepal, Tibet, Butane and Bangladesh. In Darjeeling many cultures, religions and classes meet - you still feel the flair of the former British colonial lords. Here Nepalese, refugee Tibetan, Bengali, day workers (kuli) from the south with their own religions and languages clash with rich Indian and western tourists. Climatically I found it somewhat too cold and damp in November. 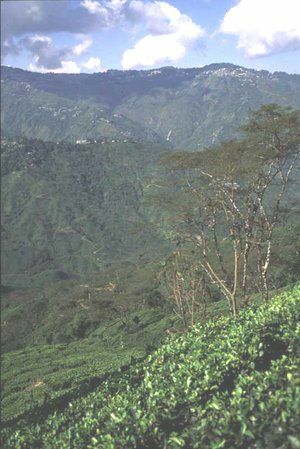 But the awsume viwes from the upper town to several snow-covered peaks over 8000m altitude and valleys covered with tee plantations made up for that. The hospital is in the lower, poorer part of the town that is reached down many winded steps. Officially there are 300 beds and unofficially 500 patients. The conditions are so indescribable that I lack the words to picture it. The absolut necessaties are missing: hygiene, running water, medicines, diagnostic devices (neither electrocardiogram nor ultrasound). The missing technical diagnostic possibilities are replaced by the clinical investigation, as far as paussible. 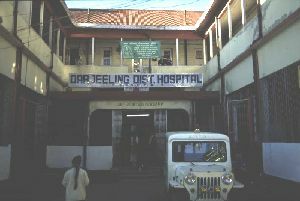 The language of the physicians among themselves is Bengali and that of the nurses and most patients is Nepali. The physicians speak very good, most nurses good and some patients moderate English. But because I represent a kind of curiosity, there always are doctors or nurses most willing to translate. 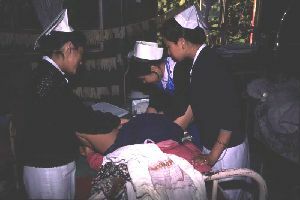 The patients represent the poor and poorest cast of the population. They cannot afford to invest larger sums of money for additional medical treatment. The average income of a family is 1-2 euro per day, by some far less. 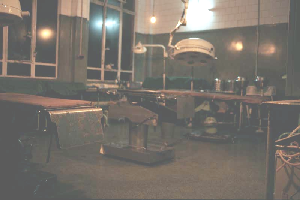 In the morning I accompany Dr. Chaudhuri on his round, examine the patients and assist in the operating theatre. Operations are manly cesarians and hysterectomies. I spend the remaining time on the labour ward with 6-12 births per day. 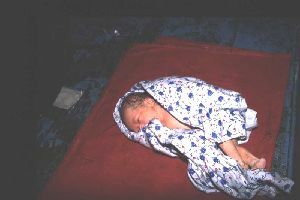 The midwives and nurses are extremely willing to teach me their art so that I counducted 15 birts this month my self. In addition I get an insight of Neonatologie. Each day has something new and breath taking. Often there are complications like acute eclampsia [pregnancy high pressure], sepsis [blood poisoning], bleedings or shock. Under these devastating circumstances this is treated, without even the slightes glimps of modern western intensive care. Neither meaningful laboratory diagnostics (not even electrolytes) nor diagnostic immaging is available. This brings me in close contact with life and death, what lies side by side here and determines peoples everyday (lit. each day) life here. The OT deserves mentioning specialy. For one thing the mismanagement becomes still clearer here and for the outhere there is always somthing to do and see. The OT has three tables, which are occupied by different specialities at the same time. The surgeons are removing a gall blader, Mrs. Dr. Banerjee, the second gynecologist is occupied with a cecarian while at the third table a spinal for a hysterectomie is beeing applied. Everybody is continuosly standing on each others feet. And on some days the whole bazzar is drounded in the screams of a patient on a provisional strecher, whose leg is beeing amputated. 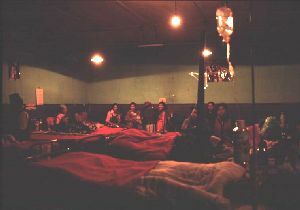 You must imagine the basic conditions being as folows: no runing water, only two (functioning) anesthesia apparatuses (from shortage of money they sometimes are run with ether), normal bulbs as source of light and should these not be sufficient a flashlight, an autoclave [sterilisation equipment], that is run on the gas burner and perhaps still one or two patients lying in the entrance area on the ground waiting in the queue for their turn. Despite these unbelievable conditions with so much sorrow and pain, I seldom have experienced so much laughter and so much human warmth. My practical training here in Darjeeling was a particularly intensive personal experience as well as an inestimable practical training! The pediatrition mentioned to me recently: "At your place you can't do a single treatment without a row of examinations. Here we have to treat without any [technical] examinations at all. We have to relay purely on our clinical assessment and God will help!" This report was published at Medi Learn.